Applications must be postmarked by May 15. Details and a downloadable application form are available at extension.missouri.edu/centuryfarm. The Ag Connections newsletter took the place of our AG Beat and contains information for agricultural producers that is timely and informative. On Oct. 13, 2017, the U.S. Environmental Protection Agency (EPA) announced an agreement with Monsanto, BASF and DuPont on measures to minimize the potential for off-target movement of Dicamba and further ensure effective use of three pesticides: DuPont’s FeXapan, BASF’s Engenia and Monsanto’s XtendiMax. The Missouri Department of Agriculture announced Missouri-specific restrictions for ENGENIA, XENDIMAX and FEXAPAN, including training requirements, a notice of application form, specific application times and cutoff dates for application. Find the complete details of these restrictions and information on training at http://agriculture.mo.gov/plants/pesticides/dicamba-facts.php. 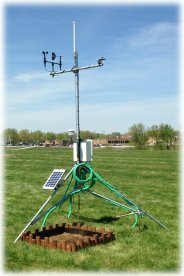 Real time weather is provided as a service to the community with the collaboration of the Putnam County R-1 school district, the Kansas City/Pleasant Hill National Weather Service and Putnam County University of Missouri Extension. For Putnam County Weather information, click on the Weather Station Icon Below to get the weather statistics for Putnam County! These rates were compiled using the survey responses of 226 Missourians who are involved with cash renting farm land. Every rental situation is different, so this guide should be used as a reference in addition to considering other factors in your area, including average yield, soil types, the number of acres available for rent in the area and the demand of rental land. The guide includes rates of crop and pasture land by acre, crop land by yield, pasture by stocking rate and rates for farm buildings. You can find this MU Extension publication by clicking G427, 2015 Cash Rental Rates in Missouri. This is the last update, it is only updated every 3-4 years.